Comments will be posted daily! The park was named for Robert Harmon Bond in 1958. 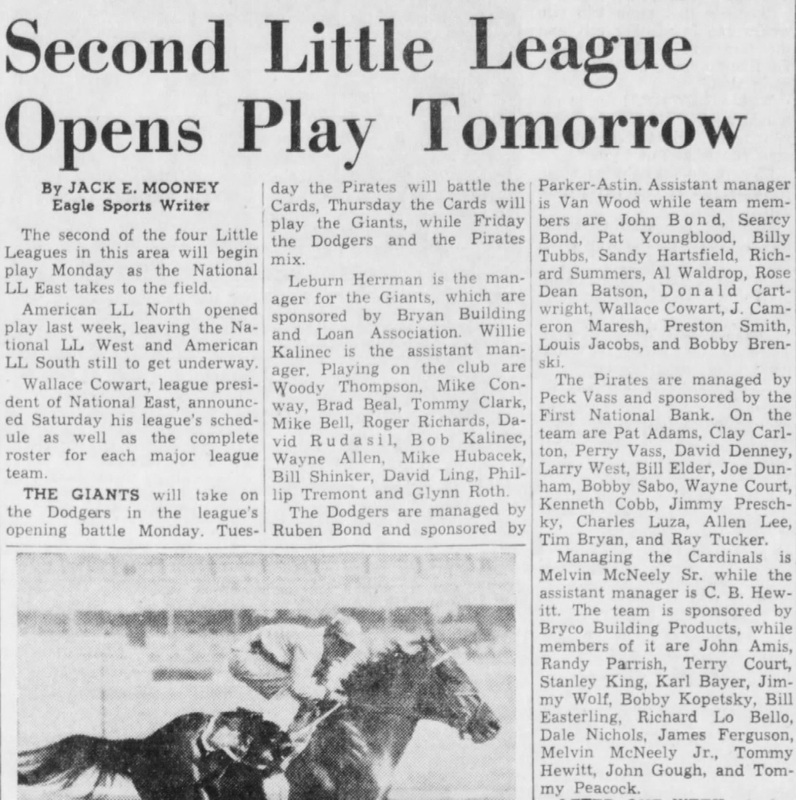 Bond was a highly thought of little league player who lived hear the park, and passed away in a hunting accident when he was 13 years old. 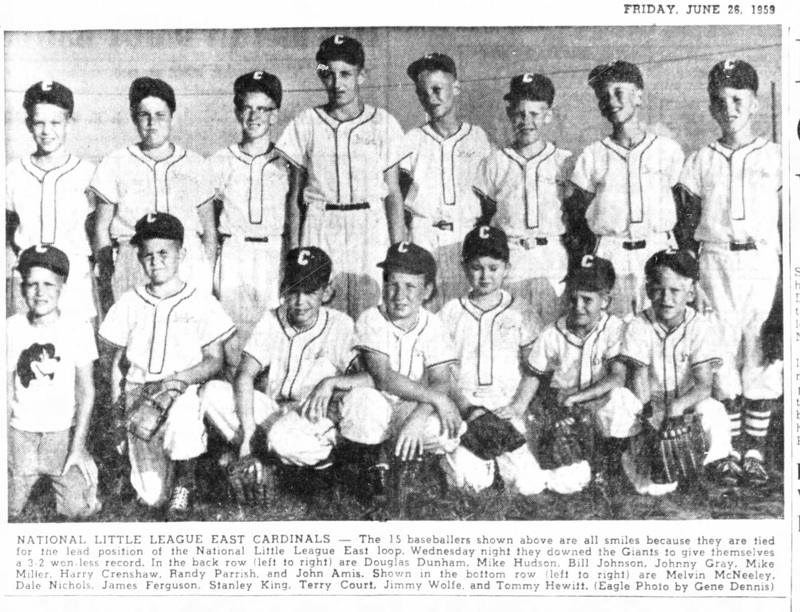 FOR LITTLE LEAGUE EAST IN 1957. AND CHARACTER OF THE NATION. The park is located next to a National Guard Armory. The armory is on land that formerly was the Eastside Disposal Plant. It was not a water treatment plant, it was just where all the sewer lines on the east side of Bryan went. The creek that it drained into was named Sewer Creek until the late 1960’s when it was changed to Briar Creek. Memorial Forest was being built downstream and for marketing purposes it was thought a name change would be in order. There was probably a city dump on the property as well. Several tracts were purchased by the city between 1919 and 1938. In 1947 the new water treatment plant was built at the lower end of Burton Creek, and everything was re-routed that direction. About the time the city didn’t need the sewer plant anymore, the U.S. Army was returning home and needed a place to stash its much larger inventory of stuff. 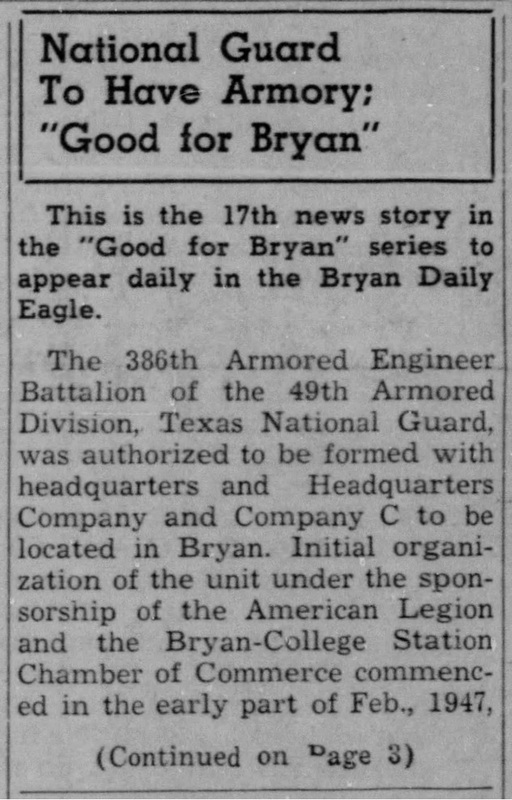 Bryan competed with other towns and won both the Texas National Guard Armory and the Army Reserve center about the same time. In the case of the Army Reserve Center on Carson Street, the city bought the land from Travis Bryan, I. It is interesting that both facilities have baseball fields adjacent. The land the armory is on was gifted to the National Guard by the city of Bryan and is deed restricted so that if the land is not used as a National Guard armory, ownership reverts back to the City of Bryan. See the deed here for more details. A pretty fair amount of the land that Bob Bond Park sits on is City owned. See map for more info. ; the parcel of land that includes Harrison field’s outfield and the parking lot next to it is city owned. Parker Field was named after Larry Parker and his son who passed away while coaching and playing in the league. Harrison Field is named for Roland Harrison who saw the need for a Senior league field and collected enough donations to build it - he considers it the "pride of his life." 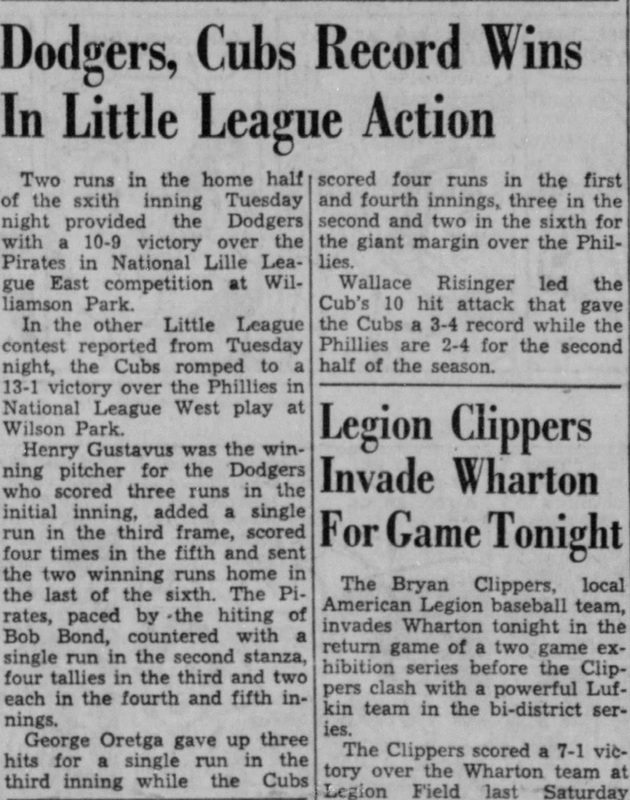 Roland hit the first home run in BCS the year little league started here in 1952. He coached Little League for 30 years and has a son who played for Bryan High, Texas A&M and 9 years with the Kansas City Royals. BNLL has been playing on fields at the Armory for a long time. 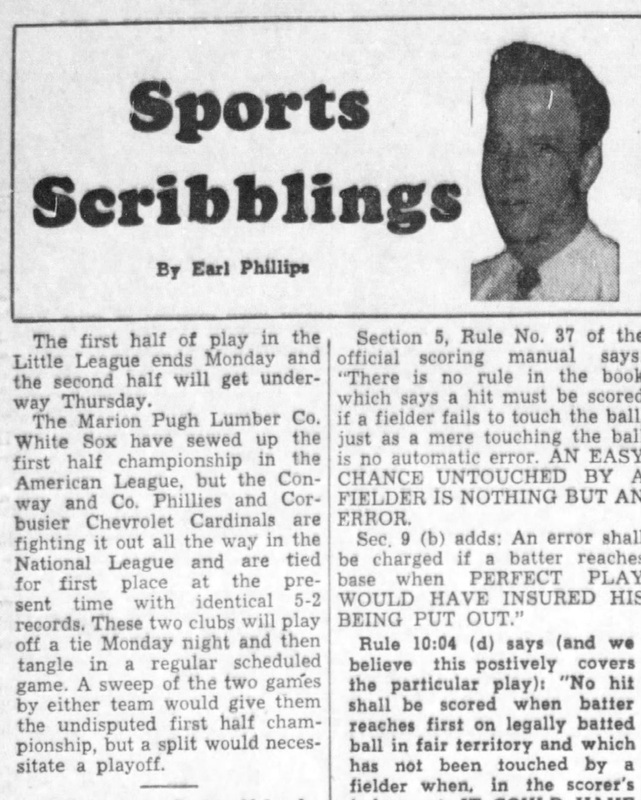 Below is a timeline of events and articles from The Eagle, note the first game was played at the Armory on May 31, 1954 between the Giants and the Cardinals. 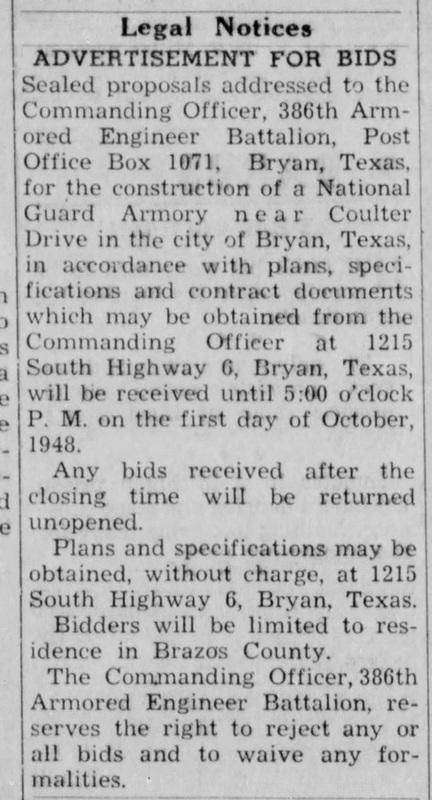 1948, January 17th - Plans for 25th Street National Guard Armory to be built. It was "also to serve as a civic center for Bryan, a community meeting place that will be an asset to the city." 1948, June 15 - City calls for election to gift land to the National Guard for armory. 1948, September 23 - Ad for bids to build 25th Street armory. 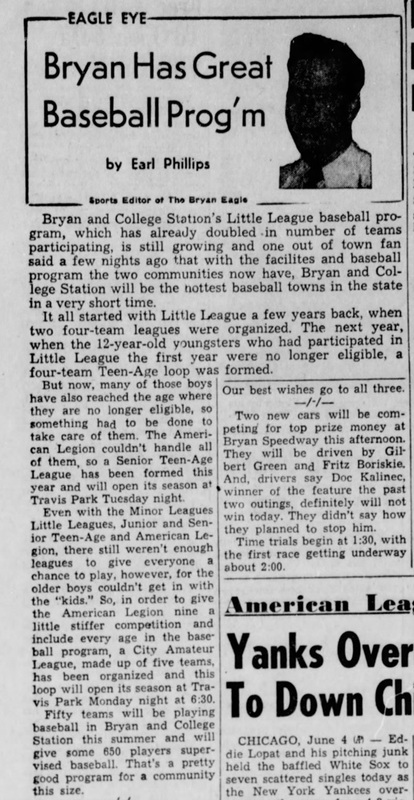 1950, August 28 - Interest in forming Little League in Bryan starts..."for not only does it give the youngsters very good supervision, but trains them for American Legion baseball and develops clean sportsmanship. 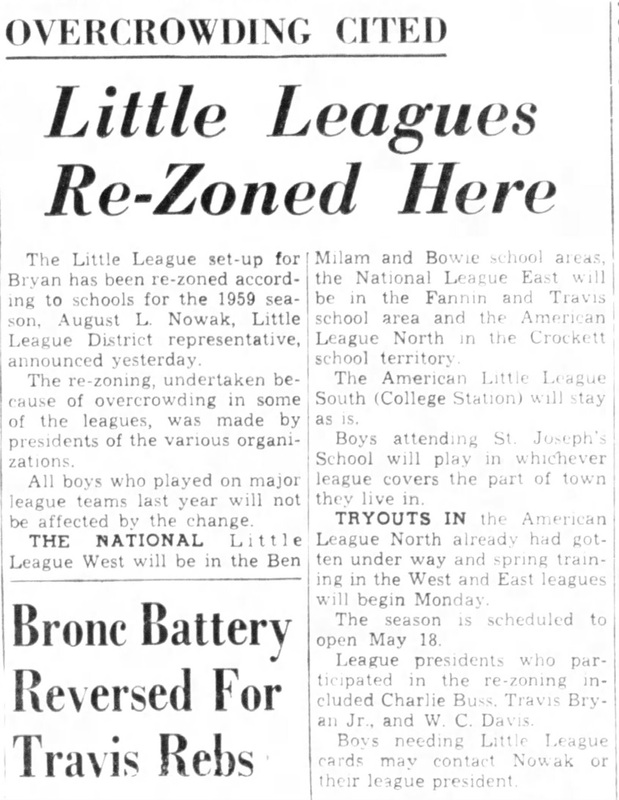 We feel sure that Brazos county will have a little League next year..."
1951 - First Season of Little League in BCS. One league with 4 teams for all BCS. All games played at Williamson Park. 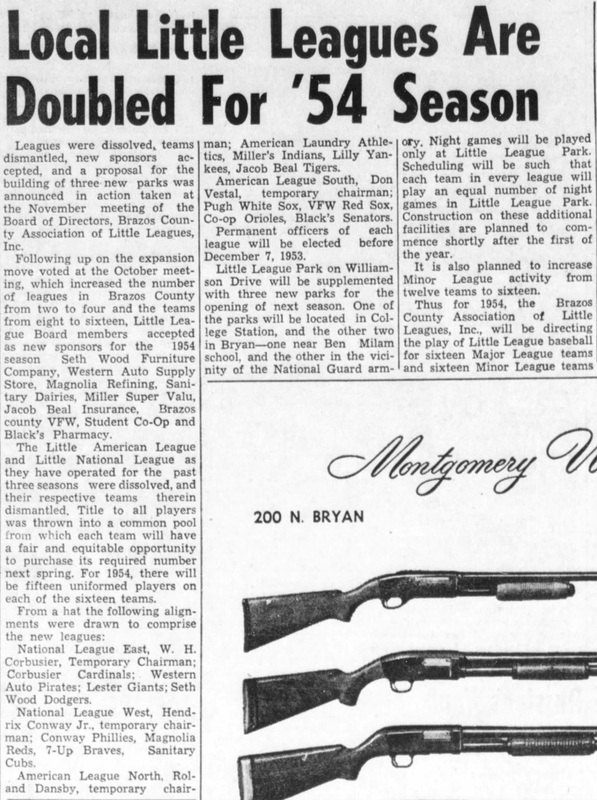 1952, May 4 - Season to begin..."Lights have been installed this season and this will allow the teams to play at night. Bleachers will be set up before Saturday." 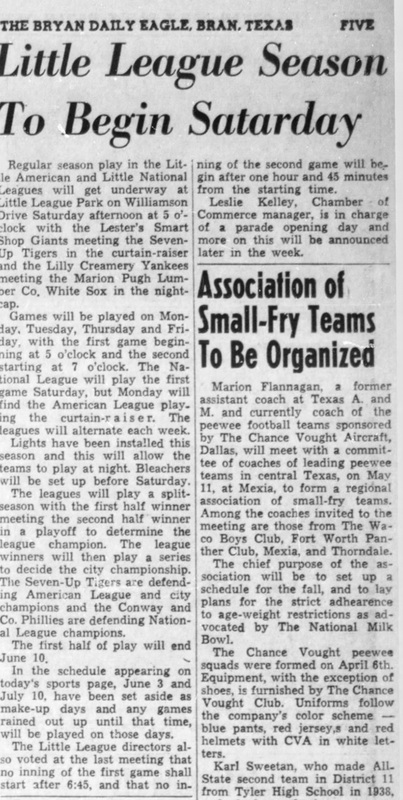 1954, May 23 - Season to start with downtown parade and, "Bear Bryant, head coach and athletic director at Texas A&M will toss the first ball into the mitt of Aggie Baseball coach, Beau Bell..." Note, the picture of Clifton Carter. You can read his testimony in the Warren Commission Report. Carter was from Bryan and an LBJ political operative. He was riding in the third car in the motorcade in Dallas and helped the Secret Service unload JFK at Parkland Hospital. 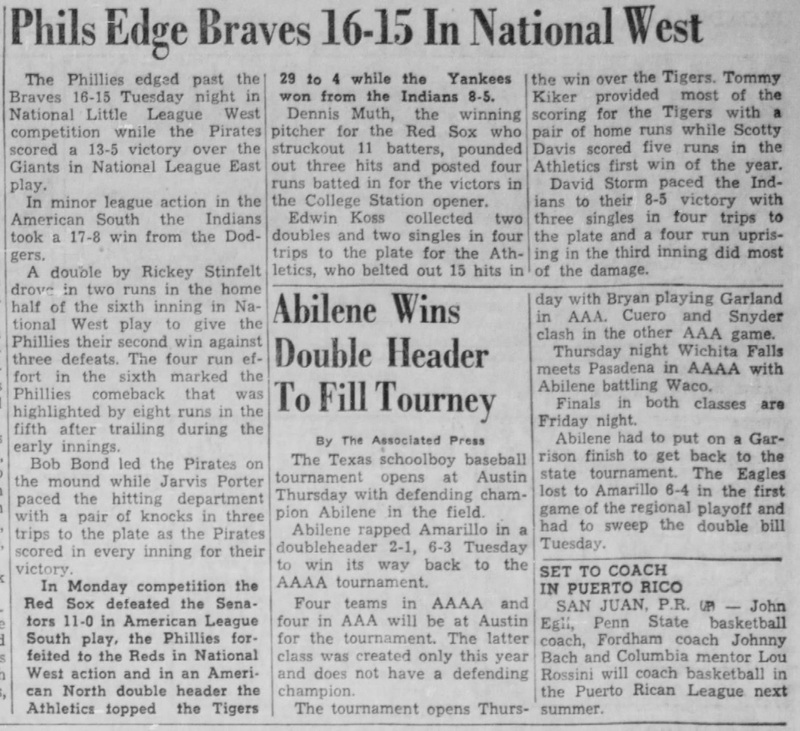 1955, June 5 - "Fifty teams will be playing baseball in Bryan and College Station this summer and will give some 650 players supervised baseball. That's a pretty good program for a community this size." 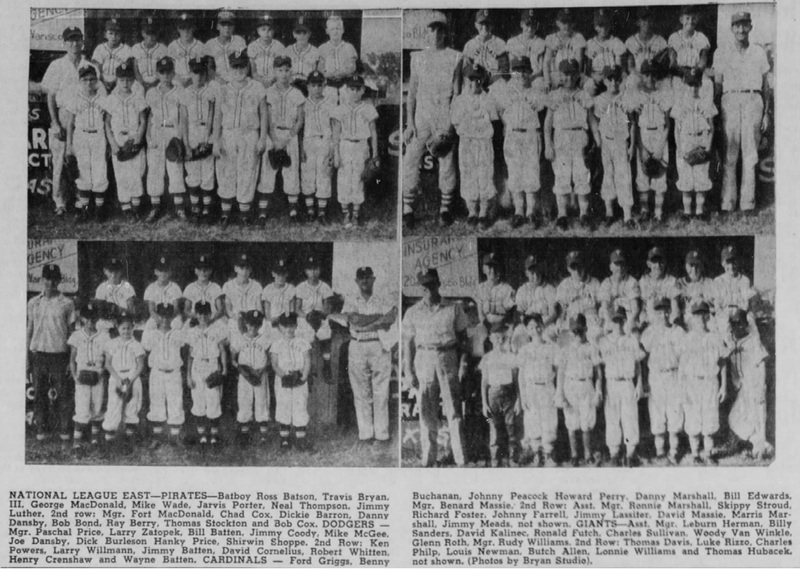 1956, July 22 - National League East Team Photos...Note, Bob Bond is pictured in the top left photo, as well as Travis Bryan, III. 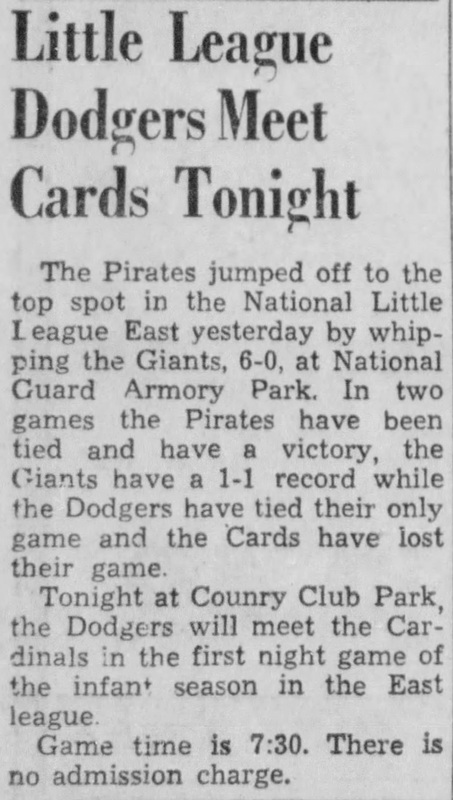 1957, July 10 - Bob Bond game with a hit! 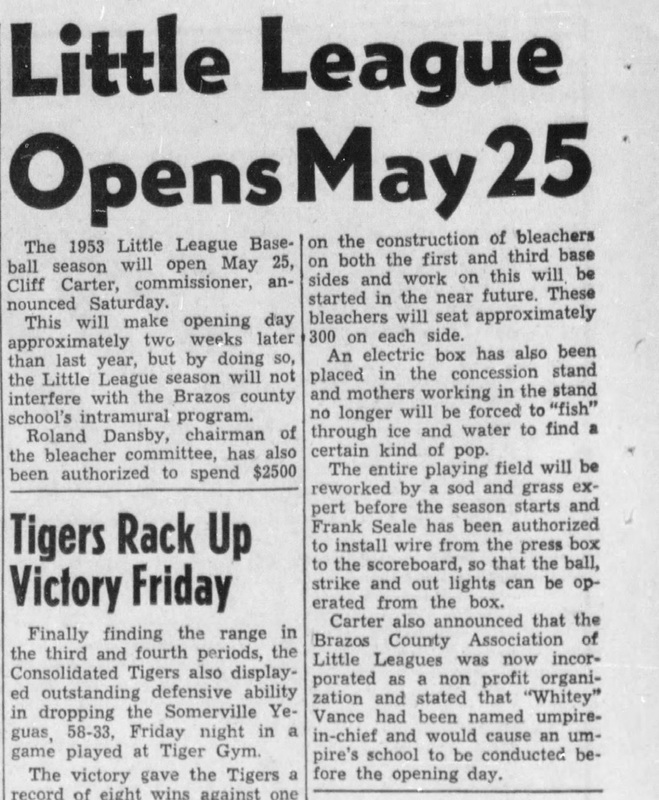 1959, April 19 - The Little League set-up for Bryan has been re-zoned according to schools for the 1959 season... The re-zoning, undertaken because of overcrowding in some of the leagues, was made by presidents of the various organizations. ...the National League East will be in the Fannin and Travis school area... 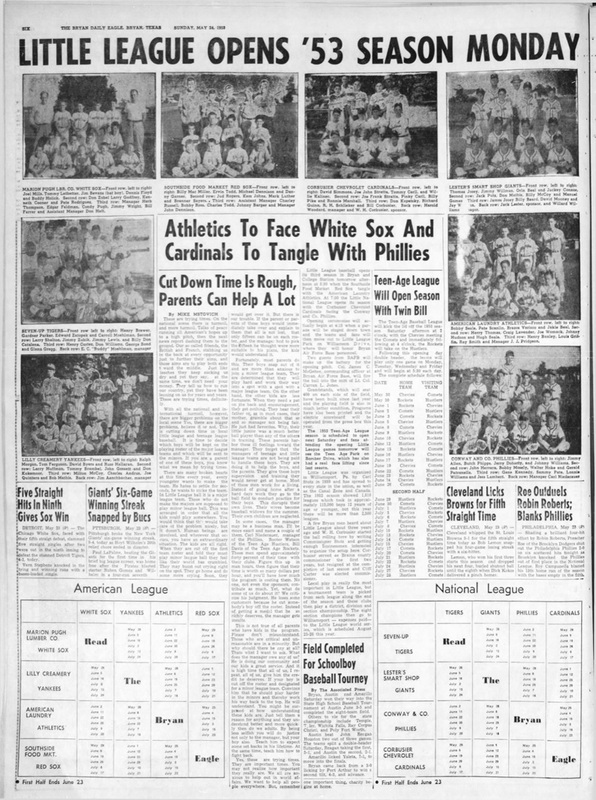 Boys attending St. Joseph's School will play in whichever league covers the part of town they live in." 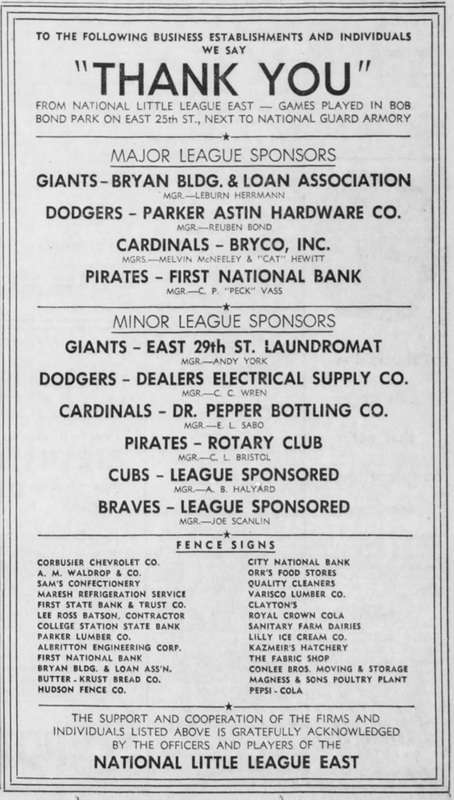 Interesting note, Travis Bryan Jr. was one of the league presidents. We'd love to hear from you! Please leave your memories of Bob Bond Park Here! Many great men did a fine job! Love this article. It's very interesting to read. Peck Vass was a dear friend of mine and it's nice to see these fine people with great vision are not forgotten!